This Japanese eggplant recipe makes a great appetizer. Japanese eggplants are perfect for easy grab and go vegan dishes. 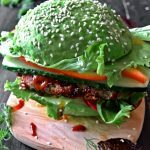 Are you looking for healthy eggplant recipe for dinner? 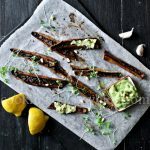 Roasted eggplant with avocado pesto is a winner! Moreover, Japanese eggplants are easy and fast to prepare. You can slice it into rounds or lengthwise. Throw it on the grill, pan or in the oven and it will be ready in less than 30 minutes. Well, this Asian eggplant recipe will suite your needs to make a tasty, easy and healthy dish! By the way, did you know that eggplant is not a vegetable, but a fruit? But of course we don’t want to eat it uncooked like a pear! Japanese eggplants are long and slim, with beautiful inviting dark purple color. They have a tender skin and taste sweeter and milder than the regular eggplant. Moreover, oriental eggplant is juicier than the Globe variety. You can use Chinese eggplant too for this recipe. The difference is only in color, which doesn’t have impact on the recipe at all. They are available in different shades of purple in different markets around the world. However, Chinese eggplant is just slightly more sweeter. I didn’t taste any bitterness, enjoying this Japanese eggplant recipe! It is seedless and that’s why even less bitter than a regular eggplant. You can easily substitute Chinese or Japanese eggplants one for the other in this recipe! Japanese eggplant has a thin skin, so it is no need to peel it and you can grill or bake them. 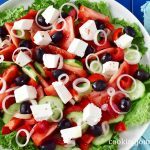 It will be soft and pleasant to eat! By the way, eggplant is probably one of the most versatile ingredients to cook with! Check also our vegetarian Stuffed Eggplant Boats. 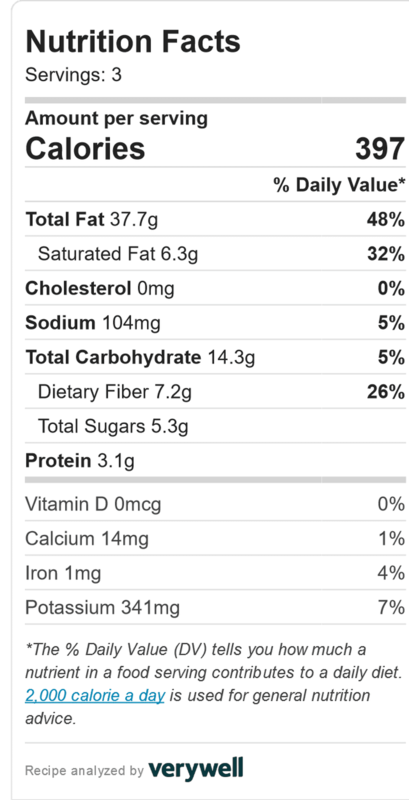 Moreover this fruit (or vegetable, if you wish so) is healthy, very low in calories, fat and sodium. Eggplant provides fibre, vitamins C, K, folate (B9), potassium and manganese. It is best to store unwashed Japanese eggplant in a perforate plastic bag in the fridge. But they don’t last long. Better choose a nice-looking ones in store and prepare straight ahead. To choose Japanese eggplant, look for smooth and shiny skin or the ones with less damage and no cuts. Inspect the stem and cap, it should be green and fresh, not dry and brown. Wondering how to cook Japanese eggplant? Here is the trusted and tasty way! You can bake eggplants just drizzled with a little bit of olive oil and serve with any greens and nuts you like. This time I’ve made a marinade to lift up the flavors of eggplant, Japanese style. Wash and dry eggplants with a paper towel. Slice lengthwise and put on a baking tray skin side down, layered with parchment paper. In a glass or bowl combine equal amount of light soy sauce, oil, vodka and a pinch of sugar. It is very similar to teriyaki style eggplant. Definitely a good substitute to the Miso glaze. Cut the flesh of eggplants to form diamonds, but don’t cut the skin. Gently push the eggplant from skin side with your hands, so that the cuts will open more. It will help to marinate the inside of the eggplant and the final dish will look beautiful. Brush eggplants with soy marinade, preheat the oven and bake until soft. Simple recipe! After roasting, slice eggplant into delicious bites that are easy to grab as an appetizer. Avocado pesto is a great addition to any pasta or vegetable dish. But it is so good with these roasted Japanese eggplants! 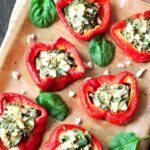 This pesto is made with avocado, cedar or pine nuts, garlic, olive oil and dry basil – all blended together until smooth. Just make sure your avocado is ripe and soft. Choose the one that is slightly soft, but not mushy, when you gently squeeze it. Moreover, it should have a dry brown stem or cap, dark color skin. 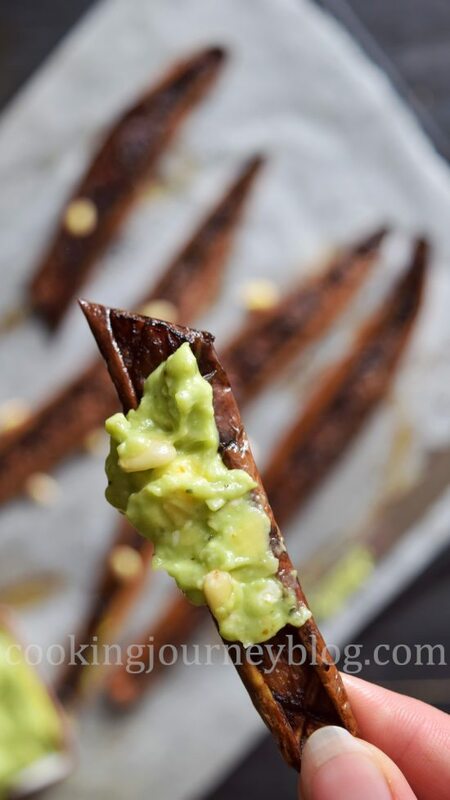 or wrap avocado in foil and bake for 10 minutes in 195 F / 90 C preheated oven. Avocado pesto is a perfect healthy and tasty smearing on top of you morning toast. But also very good for dipping roasted Japanese eggplant slices! As the eggplant has almost no fat, avocado and pine nuts add some healthy fats to this dish. And more vitamins E, K, C. Avocado provides fibre and protein, potassium and copper. 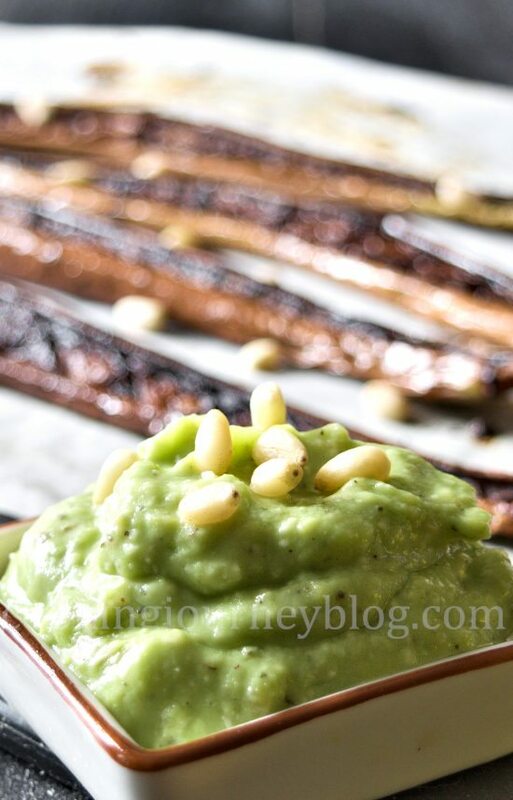 Try this tasty and healthy eggplant appetizer with avocado pesto! Check also our Grilled Halloumi and Avocado salad – perfect to make this summer. If you have any questions or suggestions, please leave a comment below, we will be happy to answer! This Japanese eggplant recipe makes a great appetizer. Are you looking for healthy eggplant recipe for dinner? 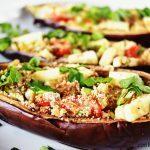 Roasted eggplant with avocado pesto is a winner! In a glass or bowl combine soy sauce, vodka, sesame oil and sugar. Wash eggplants and dry with a paper towel. Preheat oven to 425 F / 210 C.
Slice eggplants lengthwise and put on a baking tray with skin side down. Cut the flesh of eggplants to form diamonds, but don’t cut the skin. (See the photo in post). Gently push the eggplant from skin side up with your fingers, so that the cuts will open more. Generously brush eggplant flesh with soy marinade. Bake 30 min or until the eggplant is soft (check with a fork). Meanwhile peel avocado, cut it in half and remove the pit. Blend all ingredients for pesto, including avocado and place in the serving bowl. Cut baked eggplant into thirds and serve hot or cold, sprinkled with cress salad, pine nuts and avocado pesto aside. * You can substitute Japanese eggplants to Chinese eggplants. 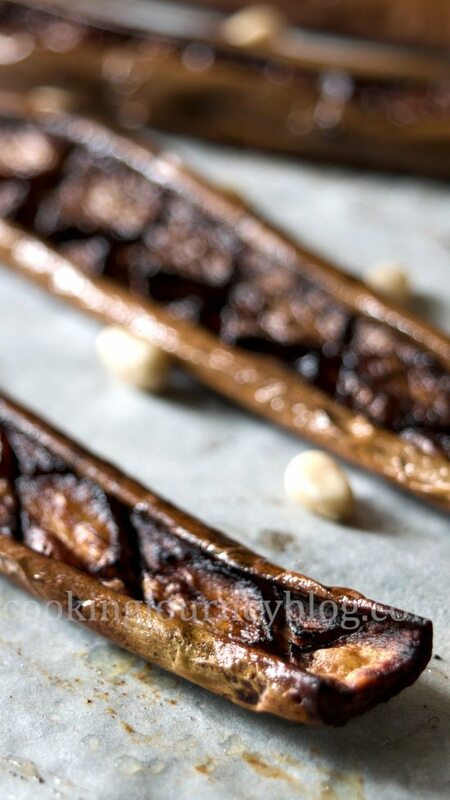 Wow, this is such a unique recipe…I adore Japanese eggplant, but I’ve never thought to roast them before, what a perfect summer meal these make. I’ve never seen a Japanese eggplant before! I’ll have to keep my eyes open for them now – the avocado pesto on top sounds so good! They are looking cool, actually, long, dark purple colored veggies. And the taste is milder. Oh, this looks so delicious! I haven’t tried Japanese or Chinese eggplants yet! They sound awesome! I love that they are seedless too. I may even talk my husband into eating them! sure, you need to try it! I have never had these! Now I’m eager to try them!! !